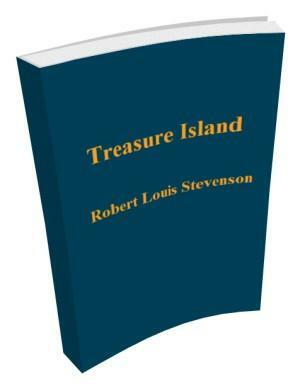 Treasure Island is a classic work of fiction by Robert Louis Stevenson. Start reading here then download the free eBook (free pdf). “Well, then,” said he, “this is the berth for me. Here you, matey,” he cried to the man who trundled the barrow; “bring up alongside and help up my chest. I’ll stay here a bit,” he continued. “I’m a plain man; rum and bacon and eggs is what I want, and that head up there for to watch ships off. What you mought call me? You mought call me captain. Oh, I see what you’re at—there”; and he threw down three or four gold pieces on the threshold. “You can tell me when I’ve worked through that,” says he, looking as fierce as a commander. me over hedge and ditch was the worst of nightmares. And altogether I paid pretty dear for my monthly fourpenny piece, in the shape of these abominable fancies. in a passion of anger at a question, or sometimes because none was put, and so he judged the company was not following his story. Nor would he allow anyone to leave the inn till he had drunk himself sleepy and reeled off to bed. the inn would be ruined, for people would soon cease coming there to be tyrannized over and put down, and sent shivering to their beds; but I really believe his presence did us good. People were frightened at the time, but on looking back they rather liked it; it was a fine excitement in a quiet country life, and there was even a party of the younger men who pretended to admire him, calling him a “true seadog” and a “real old salt” and such like names, and saying there was the sort of man that made England terrible at sea. hands after such a rebuff, and I am sure the annoyance and the terror he lived in must have greatly hastened his early and unhappy death.